Fall Foliage In The U.S.
It’s that time of year when the temperature starts to drop, the leaves change color, and change is in the air. Fall is one our favorite seasons here at Earth Networks. Activities like pumpkin picking, hiking, and decorating are all favorite pastimes of people throughout America. Another fun and uniquely autumn activity is observing fall foliage throughout the U.S.
During the fall, each state in the U.S. will experience its own special view of the season. While many people associate the Northeast with the best foliage, there are plenty of places throughout the country with beautiful sites. Changing ash, hickory, maple, and oak trees make for postcard-like views in almost every state. We want you to get out there and enjoy nature. 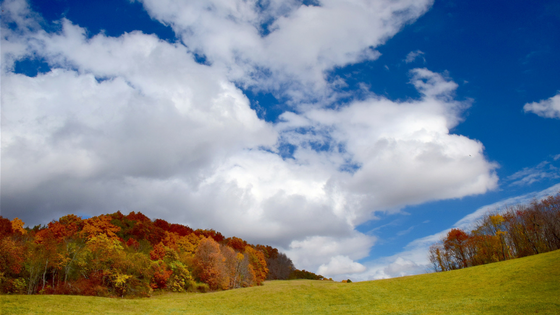 That’s why we’ve put together a list of the top 10 places to see fall foliage in the U.S. So throw on your sweaters, get a mug of hot apple cider, and visit the best places for fall foliage. Don’t forget to play some songs for fall weather on the way! The first stop on our list is Maine. Maine is one of the best places for fall foliage normally early on in the autumn season. The area of Bar Harbor is particularly popular for foliage viewing. Although popular with tourists, the area is large and you can find your own private areas to see the gorgeous colors on the trees. The area is full of beautiful historic hotels to stay at. Any foliage trip is always better when they are multiple ways to view the reds, oranges, and yellows of the changing leaves. These area has great kayaking, bird watching, and whale watching expeditions. If you go, make sure to visit Acadia National Park and take lots of pictures! The second area on our list is in Both North Carolina and Tennessee. The Great Smoky Mountains are a wonderful place to get a good view of fall. The National Park, which extends from North Carolina to Tennessee, is perfect from early October to late November. This is because it’s full of 850 miles of stunning forests with hiking trails of all levels. You can also view the foliage from your car or motorcycle. There are also plenty of places to stay in the area, no matter which state you’re in. On the Tennessee side of the park, take a look at the town of Gatlinburg. It’s not far from the park entrance and is a beautiful historic town. 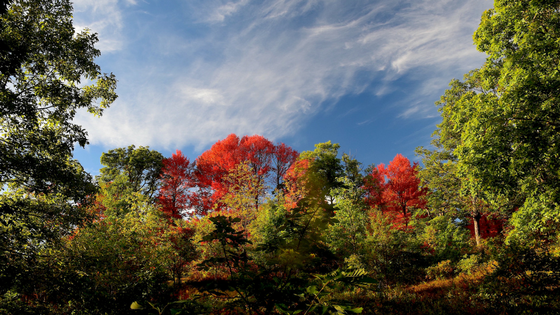 The third state on our list of best places for fall foliage is New York State. While you can see some foliage in Central Park, you want to get away from the city and head to the Catskills or the Adirondack Mountains for the best views. The Catskills alone take up over 6,000 square miles and are home to thirty-five mountain peaks over 3,500 feet high. Here you’ll see vibrant yellows, oranges, and reds at peak typically between late September to mod-to-late October. There are also of plenty Oktoberfests and other fall festivals in the area so do some event research before you plan your trip to make the most out of it! Next on our list is Vermont. A beautiful state for nature sightseeing year round, Vermont has a short yet beautiful foliage season. Ski towns like Stowe and Waitsfield offer beautiful views of red, yellow, orange, and brown from the comfort of a ski lift! If the weather is too chilly for that, you can see plenty of foliage from the car as your drive over the mountains and through the gorges of this gorgeous state. We suggest driving on the Green Mountain Byway, from Waterbury (home of Ben & Jerry’s Ice Cream) to Stowe. We also suggest a scenic ride on Route 17 with stops at Sugarbush Resort or Mad River Glen. The northern Vermont foliage season usually begins the second week of September and peaks the first weak of October. There are plenty of places to stay near ski resorts, so we suggest you look there first. It’s also important to note that severe weather in the form of thunderstorms or even snowstorms can strike an any time. The best fall foliage locations will have a severe weather tracker on site to keep patrons safe. The next state on our list is south. Georgia isn’t typically known for its foliage, yet it has some of the best the U.S. has to offer. Any place in the U.S. that offers beautiful views of nature is going to look even better in fall colors. Take Amicalola Falls State Park, for example. Amicalola Falls is the tallest waterfall in Georgia. At 729 feet, it can be seen from many different trails along the park. If you can make it to the bottom of the falls, you’ll get an amazing view of Georgia’s plant life. This includes changing leaf colors on maple and oak trees. Other places in Georgia that offer great fall foliage views in Black Rock Mountain State Park, Cloudland Canyon State Park, and For Mountain State Park. Peak season takes place in the months of October and November, so this is a great state for some later foliage viewing. You can also take a train ride along Blue Ridge Scenic Railway as a different and run way to observe all of the changing colors. Yes, there is great fall foliage viewing in the Southwest, as well! A great place to start in New Mexico is the Enchanted Circle. This 83-mile drive connects the towns of Taos, Eagle Nest, Red River, and Questa with some spectacular fall views. This route goes through 13,161 square-foot Wheeler Peak. This is New Mexico’s highest point. The mesas and mountains here offer a unique southwestern perspective on fall foliage. While aspen trees are the most popular, there are also purple cinquefoil and cottonwoods ranging from red to yellow. The best part of the season to visit this area is late September to early October, but make sure to pay attention to local weather reports. Arkansas is the next state on our list of where to see fall colors. One of the best places for fall foliage in this state is Ozark National Forest. Ozark National Forest has more than 1.2 million acres of amazing scenery. The region begins to change colors in early October when the black gums take on red tones. The peak usually occurs in late October to early November. Another great place to visit is the Ouachitas and Arkansas River Valley. This is a bit south of the Ozark Mountains. This area takes on color within a week or so after the Ozarks. This is normally around the middle of October. The peak is typically in early-mid November. The last area, the Delta and Gulf Coastal Plain are last to change colors. This typically happens by mid-November. If you’d like a view from your car, try driving down Crowley’s Ridge Parkway National Scenic Byway or Great River Road National Scenic Byway. Number eight on our list is Oregon. This northwest state is home to beautiful mountains and cascading waterfalls which make for the perfect fall foliage landscapes. An especially popular region is the Cascade Mountains and the Columbia River Gorge. This area, between southern Washington and northern Oregon is beautiful. It’s an 80-miule long gorge that offers cottonwoods, big-lead maples, firs, twisted pines, and Oregon ash trees. The breathing-taking site includes a waterfall that can be viewed by hiking, kayaking, or rafting. The best time to visit this area is mid-September to mid-October. You can also check out Mount Hood for some biking and hiking. Keep an eye out for forest fires during dry years. The penultimate state on our list for where to see fall colors is Wisconsin. Any place along the Wisconsin River is a great place to observe fall colors. However, the Wisconsin Dells are especially mesmerizing this time of year. The Dells are peaceful and therefore a great place for foliage picture-taking. Visitors can enjoy the colors on river walks and boat tours. The last state on our list of best places for fall foliage is Montana. Possibly one of the best places to see foliage, Glacier National Park, is nestled in Montana’s northern tier. That means you have to get there early in the fall, before the first snows arrive! Glacier National Park encompasses one million acres of glacial-=carved valleys and mountainsides. By the end of September, the foliage is beautiful and the park isn’t crowded like it typically is during the summer. You’ll see some beautiful larch trees turn bright gold contrasted nicely next to evergreens. 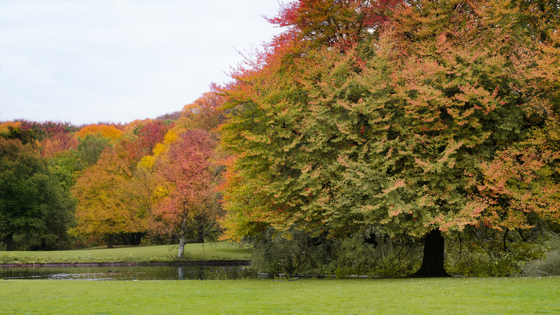 Where’s your favorite place for fall foliage? Let us know in the comments below!